I've posted a bunch about Inwindow outdoor advertising because they are tearing through the city at the same incredible rate that storefront businesses are going under. All of their success, wonderfully critiqued by Steve Lambert, is happening on false pretenses. In fact they are operating completely illegally and doing so brazenly. Take for example 936 Broadway. This location originally held a giant illegal Western Union advertisement. The building was issued a stop work order by the DOB for an "OAC SIGN ON DISPLAY WITHOUT A PERMIT" due to multiple complaints, including #1250745. 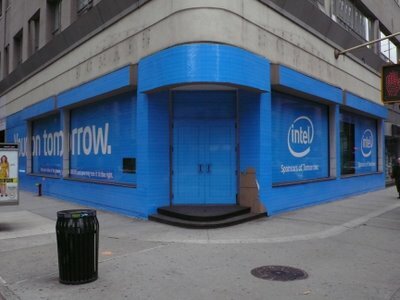 Despite this, today I walked by 936 Broadway and the copy has changed to the above Intel advertisement. Since 3-10-09 until this moment, there has been a stop work order on the property and this means there should be no work being done until that stop work order is resolved. Yet the copy has miraculously changed. Inwindow is operating brazenly indeed, and is fully ignoring the city and it's wishes. I am perplexed by this, partially because it is standard operating procedure when it comes to advertising and the city, and partially cause I don't really know how to deal with it. I want to call the sign enforcement unit, but I'm sure they already know. In fact they are probably embroiled in some absurd legal battle that prevents them from stopping Inwindow from changing the ad copy. I said it before and I'll say it again; when the city can't demand what the the law expects, who is the city serving?